In weekly cabinet meeting, PM vows to fight to remove extremist Arab MKs from Knesset, calls for condemnation of synagogue arson. 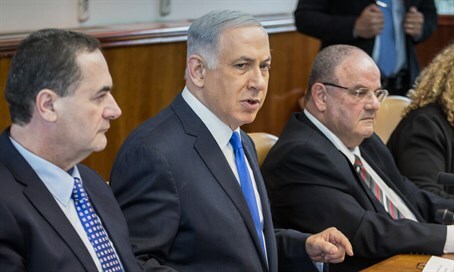 Prime Minister Binyamin Netanyahu has vowed to do everything in his power to ban from the Knesset MKs who sympathize with terrorists who murder Israelis. Netanyahu's comments were made in Sunday morning's weekly cabinet meeting, in response to the public outcry over a meeting between three Arab MKs - Hanin Zoabi, Basel Ghattas and Jamal Zahalkha - and relatives of a terrorist who murdered three Israeli civilians in an attack on a bus in Jerusalem last October. In his comments, Netanyahu referred to "three Balad MKs going to comfort the families of murderers, people who murdered Israeli citizens." The MKs were all members of the Arab nationalist Balad faction, which is one of several within the Joint List party. "I believe that most citizens of Israel feel that these MKs do not represent them," Netanyahu said. "We are making great efforts and great investments in order to integrate Arab citizens in Israeli society and they are doing the complete opposite. They are building walls of hatred." "I try to imagine what would happen in the British Parliament or the US Congress if MPs or members of Congress would stand at silent attention for murderers of British or American citizens. I think that there would be a very major outcry and rightly so." "I spoke with the Attorney General and asked him to consider taking legal action against these MKs," he continued. "I would like to examine new and reinforced legislative changes to ensure that anyone who acts in this direction will not serve in the Israeli Knesset. "I think this is an important statement as to what kind of society we want. At the same time, I will today, together with Knesset Speaker Yuli Edelstein, submit a complaint to the Knesset Ethics Committee. I expect all members of the opposition who are also rightly clamoring for justice in this matter to support these proposals." Netanyahu also called for unqualified condemnation of the torching of a synagogue in Gush Etzion, which was built in memory of three teenage Israelis abducted and murdered by Arab terrorists in 2014. In particular, Netanyahu challenged those who are quick to condemn any vandalism against mosques to show equal outrage over the desecration of a synagogue. "We are in a harsh struggle between those who – like us – seek coexistence and peace, and those who seek war and bloodshed," the Prime Minister said. "Over the weekend, a synagogue named after the three youths who were kidnapped and murdered by terrorists was set alight. "We will do our utmost to find the arsonists and bring them to justice. But I expect from everyone in the country and around the world who rightly condemn every desecration of a mosque or writing of graffiti on mosques, including the burning of mosques, I expect them to come out with the same cry against, and condemnation of, this abhorrent act."